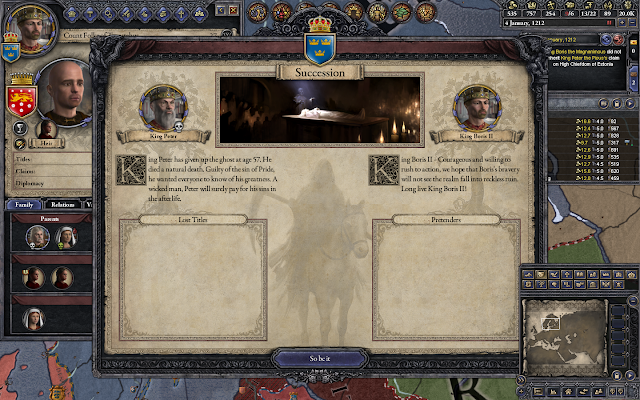 I am starting my second full game of Crusader Kings II as King Stenkil of Sweden. He is married with four sons. 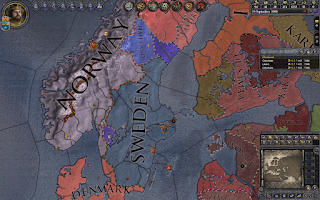 Annoyingly, Sweden has an elective monarchy. I really prefer some sort of primogeniture; anything else seems unnatural. Or at least gavelkind. Maybe I'll live long enough to change it. Until then, Prince Inge is my heir. That's fine. Let's make sure he has a good kingdom to inherit. You can see what the immediate neighborhood looks like. 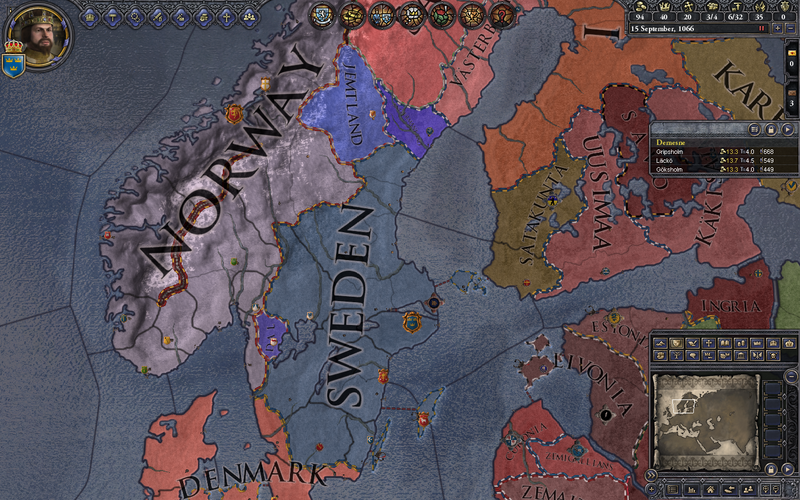 Norway and Denmark are things, and there are some small entities waiting to be embraced by the Swedish fatherland. 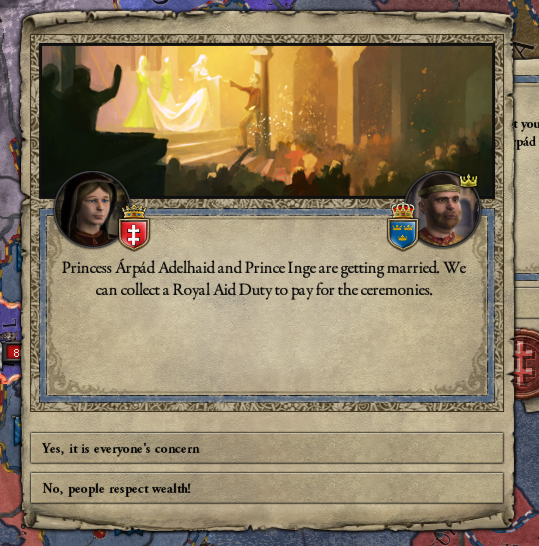 First we marry our heir off to a Hungarian princess. 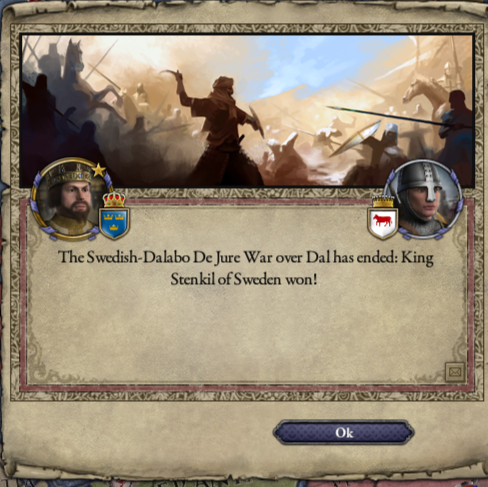 Then we gobble up Dal, a county between us an Norway we have a de jure claim on. Next, here's something I get to do that I never did in my first game -- a holy war against the infidels. We look to the north and annex Hälsingland. 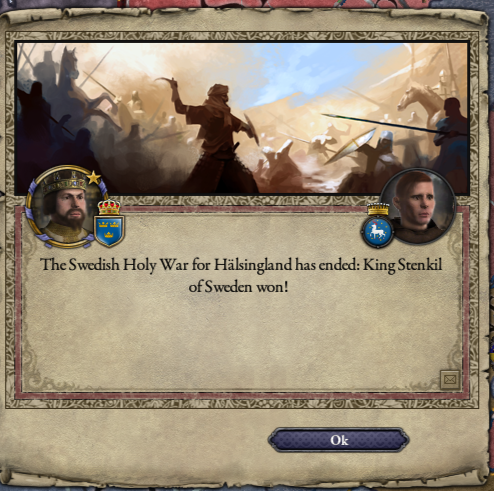 The pagans to the north joined the war, but had no effect on the outcome. In both wars, I had about 2000 men to less than a thousand for the people I was trying to conquer. I would keep going, but my vassals are getting whiny about the levies, so I'm going to consolidate for a while. I decided to limit these entries to one per monarch. If I had realized how long-lived King Inge would be, I might have made a different decision. King Inge got off to a slow start. 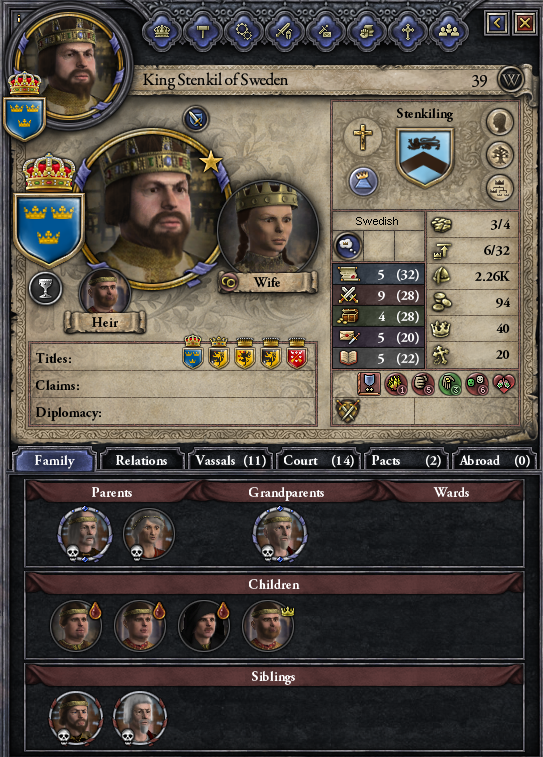 I set things up so my son Prince Stenkil was my heir. 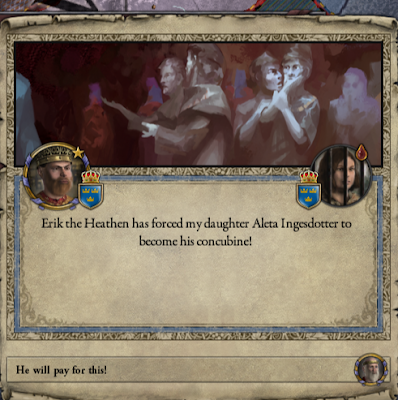 But my uncle, Prince Erik, seemed destined to cause trouble, and on January 30, 1097, he demanded the throne. My uncle is a major jerk! I fought him for two years, freed my daughter, and sued for "white peace", meaning he lost prestige and I gained it, but it was inconclusive. He is 68, so I'm hoping to wait him out. But he's got my mom, two of my daughters and my wife in his dungeons, so that is not cool. I end up ransoming my mom and my wife back, but he keeps my two minor daughters. My mom dies soon afterwards. Fortunately, so does Uncle Erik as we reach the year 1100. I think it's time to teach Cousin Sven a lesson. 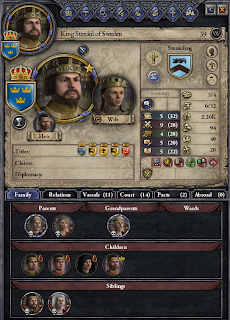 Well, as a new king, there sure is a lot of housekeeping to take care of. Appointing guardians and so on. The most important thing is to name a successor. I'm going with my son, Prince Boris. Duke Inge, however, is the current heir to Sweden. He's 64, so I could plan to out-live him. I could also plan to help that plan along. I have the opportunity to throw him in jail; maybe this is a good move. Of course it doesn't work, and he revolts. He was a useful ally to my father, but I think it's time to clip his wings. I have enough coin to hire some mercenaries to help me out. 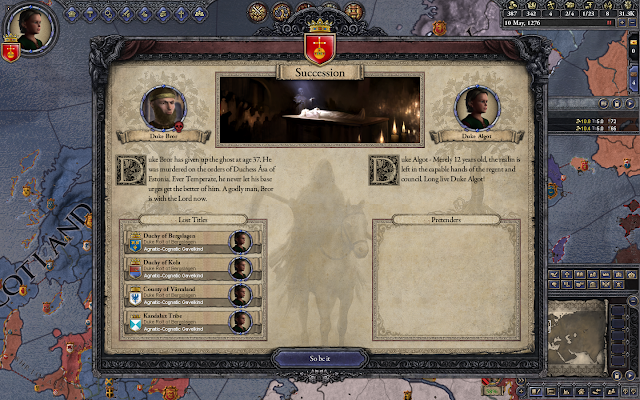 In the middle of this battle, Prince Boris favors Duke Inge as heir to Noridake instead of himself. I have to wonder about this boy. I get Duke Inge in jail, and Prince Boris is back to favoring himself. Unfortunately, I notice that Prince Boris only has daughters, and his wife is exiting her childbearing years. Well, something to sort out later, I suppose. I'm not sure what to do with this guy. I don't have that long to ponder it.